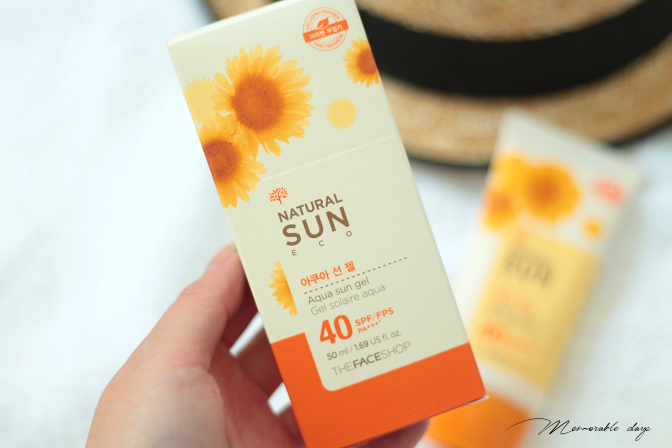 Review: The Face Shop - Natural Sun Eco Aqua Sun Gel SPF40 | Memorable Days : Beauty Blog - Korean Beauty, European, American Product Reviews. 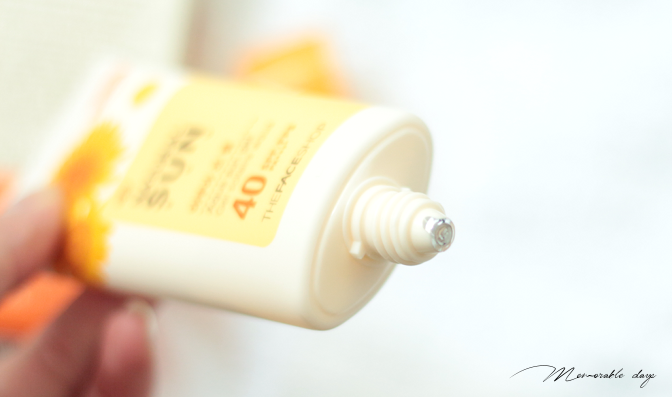 No matter if it's Summer or Winter, Fall or Spring, I always apply products on with a SPF. 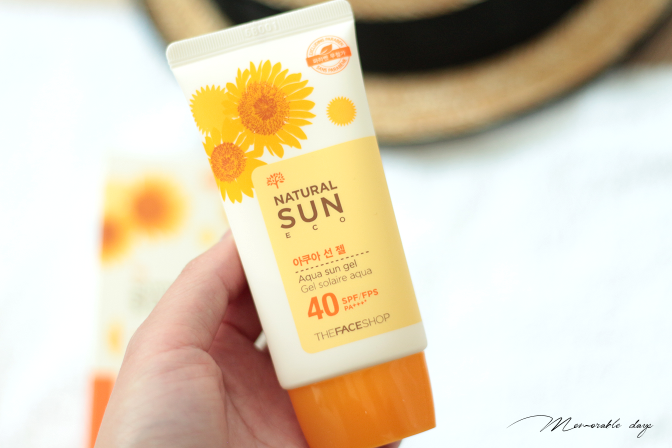 In today's blogpost I'm reviewing the aqua sun gel from Korean brand The Face Shop. This sun gel is an organic skincare product, which means it is made of fresh and natural ingredients. It includes purified extracts of sunflower sprouts which acts as a Natural Moisturizing Factor (NMF). It is refreshing and moisturizing after application. 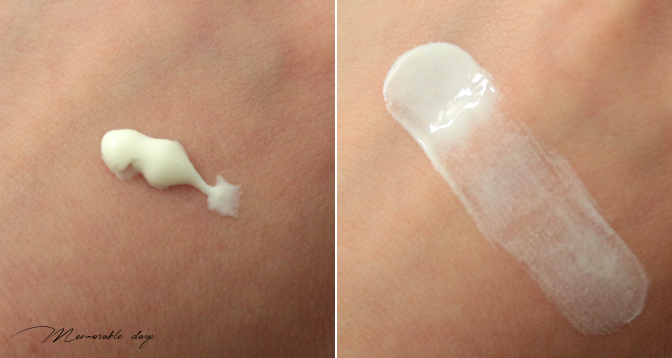 The sun gel contains more than 60% of moisturizing ingredients too. These ingredients get absorbed into the skin easily due to its gel base. 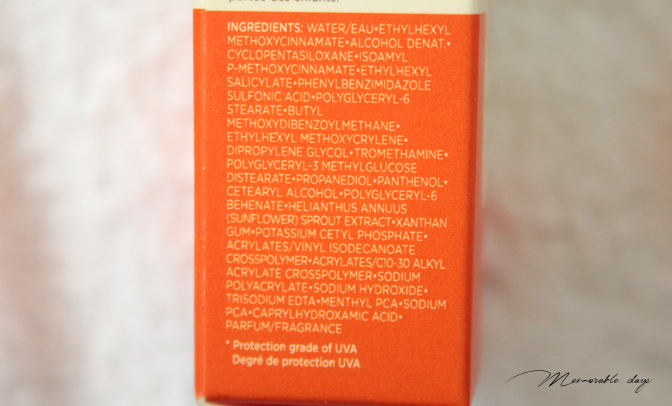 The sun block has a SPF40 PA+++ protection and it claims that it's not sticky at all. It contains 50ml of product. 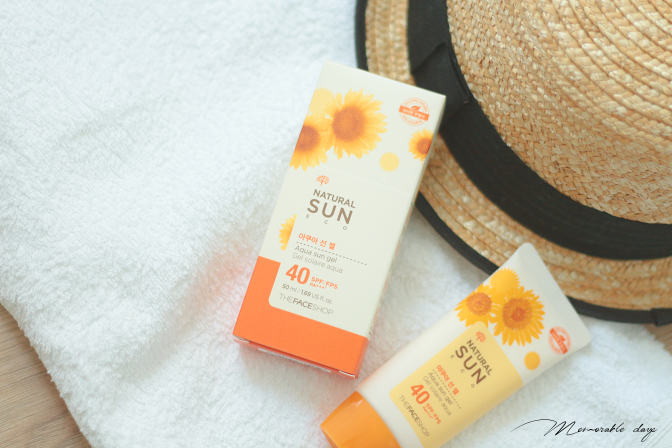 I'm loving the packaging since it looks oh so summery with all the sunflowers. As you can see it comes in a tube packaging so you can easily squeeze the product out. It has a lovely fresh rose scent that you can smell while applying it. I love how fresh it smells, but this can be a bit overwhelming for some people. The texture is more like a cream rather than a gel. It's a tiny bit sticky once applied but this feeling goes away very fast. It absorbs quickly and it's easy to spread. As you can see below the sun block is yellow colored and it doesn't look like a gel. I received this sun gel from Q-depot.com for review purposes. Q-depot is an online shop which sells Korean products worldwide. Their shipping cost is free everywhere in the world. They sell The Face Shop aqua sun gel for $12.89. I'm loving this sunblock since it smells really nice, it absorbs easily, it feels moist, has a high SPF and it doesn't give me that oily look after application. It doesn't do much on sebum control but it won't make your face look like a disco ball like some sunblocks do after application. Re-application is obviously needed during the day to protect you from the sun. note: this product was sent to me for review purposes, but this didn't affect my opinion about the products, see disclaimer.